Lithium builds trusted relationships between the world’s best brands and their customers, helping people get answers and share their experiences. 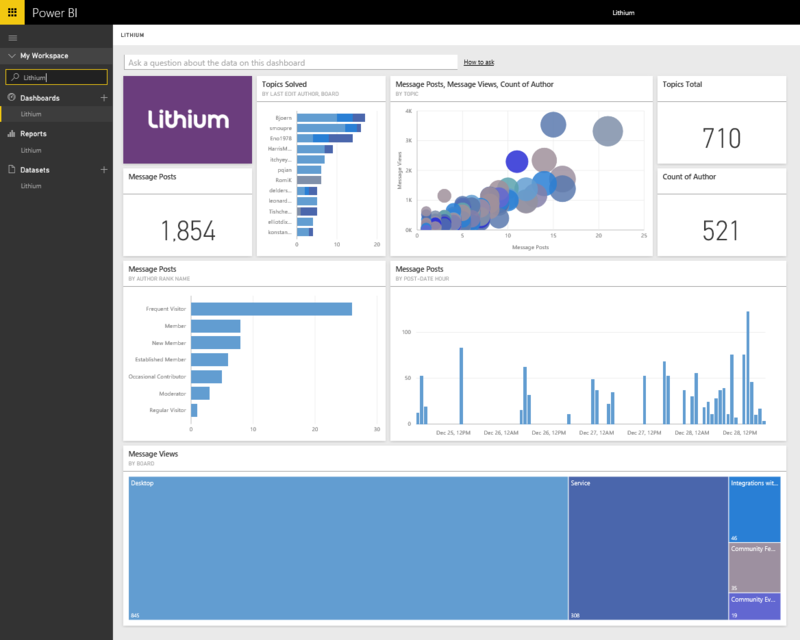 The Lithium content pack for Power BI allows you to gain insight into key measures of community performance, such as messages posted, questions solved and your most active users. This post will provide an overview on how the Power BI content pack helps users analyze and monitor Lithium data. 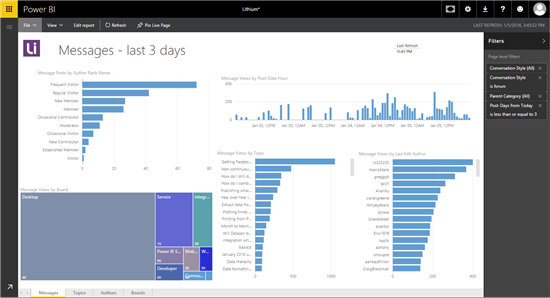 For additional details on how to get started, please see the Lithium content pack for Power BI help page. Start loading the content pack by specifying your community and signing into your Lithium account in Power BI. The content pack will provide you with important metrics and insights around your community, allowing you to better understand your customers and engage further. Once the content pack is loaded, you’ll see a new dashboard, report and dataset in your workspace. Clicking on the tiles will drill into the reports built on top of the data set, for example selecting the “Message Posts” will bring you to the Messages report. This report gives you an overview of the messages in your community. You can see the top boards and topics by message views and even how much traffic your community has throughout the day. Navigate between any of the four report pages using the named tabs at the bottom. Selecting any of the values will cross filter the other visualizations and hovering over a value will show you more details. The filter pane on the right can be opened to show or change any filters for that report. Selecting Edit Report will list all of the tables and fields that are included in the dataset. This mode allows you to add filters, create or modify visualizations and add new report pages. Selecting a visual will highlight the tables and the fields in the Fields list corresponding to that visual to make it easy to update or change the visual. You can also try asking a question about your data, such as “total posts” or “total posts by boards”. The questions can be easily updated and added to your dashboard. Any of the visualizations be pinned back to any of your dashboard to further customize it with data from multiple datasets. After you initially import the data, the dashboard, reports and data set will continue to update daily. Select Schedule Refresh on the data set to customize and control the refresh schedule. 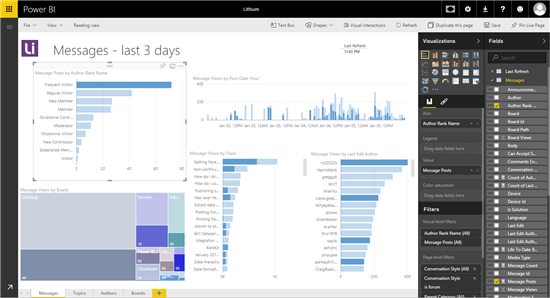 The Lithium content pack for Power BI helps you visualize and explore an initial set of metrics and reports that can be customized for your scenario.